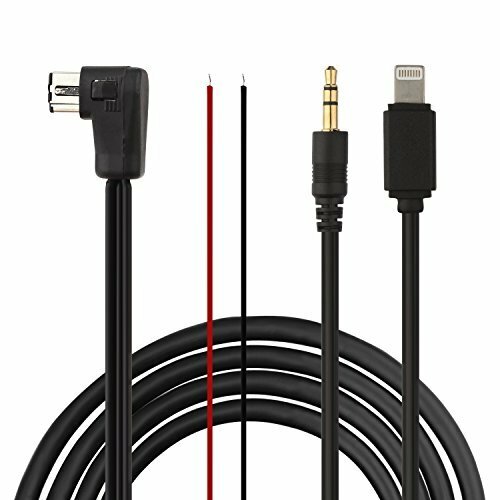 Eximtrade 3.5mm Aux and Lightning Connector Charging Cable Audio MP3 Music for Pioneer IP-BUS by Eximtrade at Buy Car Now. MPN: unknown. Hurry! Limited time offer. Offer valid only while supplies last. View More In Digital Media Player Accessories. Listen music in the iOS device via the Pioneer stereo without the loss of sound quality. This cable is for audio music and charging only, phone call is not supported. Change songs from the iOS device, no control of music from the Pioneer stereo. The playlist will not be displayed on the screen. Connect the yellow (positive) and black (ground) wires to the car, insert the IP-BUS connector on the back of the Pioneer stereo and insert the 3.5mm and Lightning connector into the iOS device. You have to activate the AUX function in the Pioneer stereo to use this product. Please note that not all the stereos have the AUX function, we suggest you to check before buying the product. Compatible with Pioneer stereo with IP-BUS input. If you have any questions about this product by Eximtrade, contact us by completing and submitting the form below. If you are looking for a specif part number, please include it with your message.